It’s marmalade season in Vermont. Third-generation English preserve maker Vicky Allard; her husband, Joe Hanglin; and their team at Blake Hill Preserves in Grafton, Vt., are busy turning crates of fresh citrus from California into glistening jars filled with luscious flavors such as bergamot-lemon and Seville orange ($5.99-$7.99). 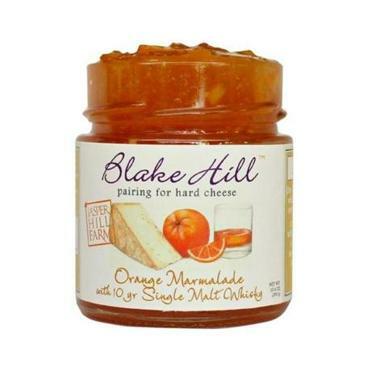 Since 2009, Blake Hill has been producing award-winning chutneys, conserves, jams, and preserves using seasonal fruit, spices, and cane sugar, with no commercial pectin, corn syrup, citric acid, or artificial preservatives. They are a natural accompaniment to the many fine cheeses produced in the region, and Blake Hill recently collaborated with celebrated Vermont cheesemaker Jasper Hill Farm. The project, creating pairings for each of Jasper Hill’s four cheeses, “was a dream come true,” says Allard by e-mail. The line includes a confit, a conserve, a mostarda, and a marmalade ($2.50-$7.99). Blake Hill has been so successful, it has outgrown its current production facility. In a few months the company will move into Artisans Park — home of Harpoon Brewery and other businesses — in Windsor, Vt. At the new digs, customers will be able to buy preserves, watch them being made, and take cooking classes. The only thing Blake Hill has to leave behind is the hill itself. Available at Bacco’s Wine & Cheese, 31 St. James Ave., Boston, 617-574-1751, www.baccoswineandcheese.com; Ball Square Fine Wines, 716 Broadway, Somerville, 617-623-9500, www.ballsquarefinewines.com; Cellars at Jasper Hill, Boston Public Market, 100 Hanover St., Boston, 802-535-9229, www.bostonpublicmarket.org; and www.blakehillpreserves.com. Elizabeth Mindreau can be reached at ermindreau@gmail.com.